one more step in the cycling world! Last year I decided that I really wanted to get more into cycling. I totally love it. The cycling bug bit me for good and now I can't (don't want to) think of a live without it. And so I started to ride more, increasing the number of rides per week and the duration of those rides. I did it gradually, too slow maybe, and let me tell you that finding time to go out is really hard some times (specially having a 4 years old daughter :-P). I also got some proper cycling clothes, cheap stuff from Decathlon at first, some more cheap stuff from Lidl afterwards, and some better stuff from brands like sportful too (also, some good stuff made in Italy should arrive soon...). Then I decided to join a cycling club. I had some conversations with my friend Xurxo about it. He had been in the cycling world for much longer than me and he knows a lot of cyclists, teams and clubs in Lugo, so I asked him for a recommendation on which club I should join. He recommended me the Club Ciclista Ribeiras do Miño, where he has some good friends. He thought I'd be comfortable among them, and he was right! And finally, earlier this year, I decided to join a Cycling Federation. Being federated has multiple benefits, you get insurance in case of accident, legal counsel, access to races and events... and, best of all, your wallet gets a bit lighter every year! Some days ago I finally got the card/ID you saw at the beginning of this post. 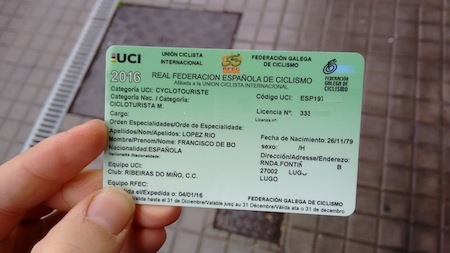 There it says that I'm now a member of the Galician Cycling Federation, the Spanish Cycling Federation and, in the end, a member of the Union Cycliste Internationale. Wow, who would have guessed this 5 years ago... o_O!